A British gentleman visiting Salisbury Plain on board an expedition cruise ship, received serious but non-life threatening injuries when he was bitten by a bull elephant seal on Monday 12th November. The elephant seal inflicted two bites and it is understood the situation could have been worse but for the quick thinking of the gentleman’s wife who raised the alarm. Medical aid was administered by the ship’s doctor and expedition staff. The passenger was evacuated back to the ship where he was stabilised. The ship returned to Stanley, Falkland Islands in order to seek further medical attention. This highly unusual and unprovoked incident highlights the importance of remaining alert to the proximity and behaviour of animals when visiting wildlife areas. GSGSSI wishes to remind visitors that, in accordance with its own guidelines, extreme care must be exercised at all times in proximity to seals. 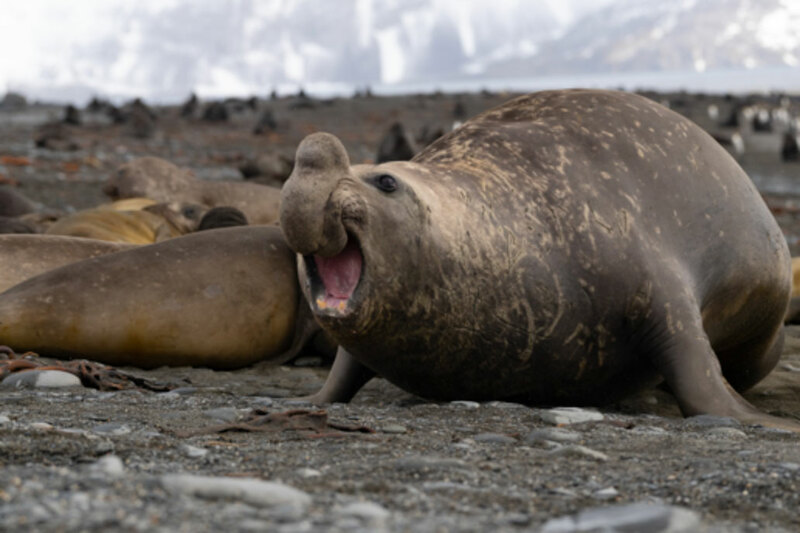 Although elephant seals generally appear to be slow moving and not overtly aggressive towards people, like all wild animals their behaviour can be unpredictable, especially during the peak breeding season. The Government of South Georgia & the South Sandwich Islands wishes the gentleman a speedy and complete recovery. The full IAATO Seal Watching Guidelines may be viewed here.